Essentially the 4200 has the same form factor as the 100 and carries most of the same specs of the 4000: a variable speed motor (5,000–35,000 RPM), larger vents, and electronic feedback that adjusts motor power and speed as needed. The important shift with the 4200 is the EZ Change mechanism (not to be confused with the EZ lock system on the bits). It puts a dual lever lock system tucked into the nose of the barrel for quick accessory change, replacing the collet-and-nut bit retention system the old Dremels have had since time began. The new EZ Change is of course compatible with the rest of Dremel’s bit line, but it also represents a shift in thinking. Standard bits have always been the focus for the rotary tool, mostly because they work well and are awesome for small jobs. But a few years ago, someone up in Mt. Prospect figured out this was a remarkably interesting system to hang attachments on. For a while, the attachment solutions have been fairly clunky since there just wasn’t a good way to strap something to the front end of it. But the EZ Change gives the entire front end a neat, simple solution to affix anything to the power, making the 4200 a great deal more “attachment ready” than its predecessors. Pricing for the basic kit that comes with the 4200, plus a small assorment of discs and grinding/sanding gear, will run you about $130. Personally, I think the EZ lock mechanism is over rated, as eventually Dremel will only make accessories for that system and discontinue the other line of accessories that don’t use that system. Additionally, they are more expensive and even with a higher price tag, the quality isn’t always there either. Long gone are the days of Dremel mostly producing most of their accessories in USA, let alone for more reasonable prices as well. But if one can afford the price and needs the product in a commercial setting, I suppose the price is justified. 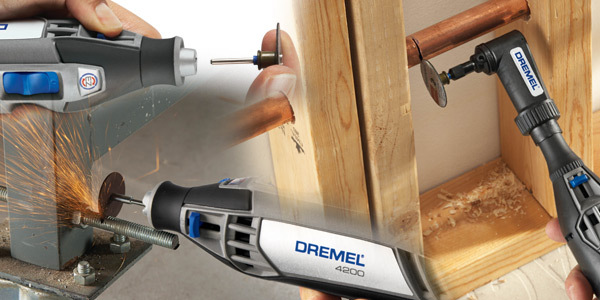 The Dremel 4200’s EZ-Change system is compatible with ALL Dremel attachments and accessories. The only thing that’s different is the way the bit is locked into the tool. The threaded neck of the tool itself is exactly the same as previous tools, so instead of having to tighten a collet, then tighten the attachment nut (ex: flex-shaft attachment), you just attach it and flick the ez-change lock down. simple. Yup, the fact that the EZ-Change system is compatible with everything dremel is one of the main reasons i won’t switch brands. Has saved me quite a bit of money in the past going through various multi-tools! He Shell, I bought one to replace my dead 1970 model. 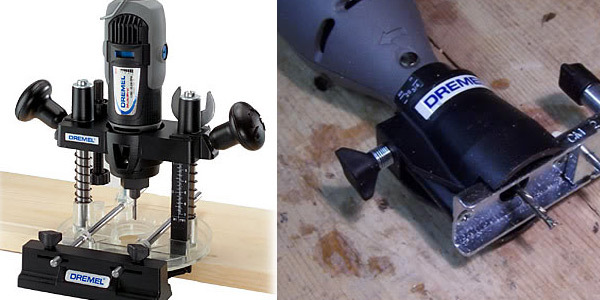 It uses the same bits as the old Dremel as well as most accessories. Being able to change bits, brushes, wheels, or whatever without reaching for a wrench is heaven. I spent more time searching my cluttered workbench for the little wrenches than I did using the tool. No more. I got a 4200 as a gift and really like it. However it had a stuck brush after about 3 uses. From the on line reviews at Walmart, stuck brushes are fairly common on the 4000 series. Dremel sent me a new 4200 but didn’t seem to want the failed unit back. I took the bad one apart and I think the problem was cutting dust getting into the brush holder and acting like hot glue to stick the brush. The brush moved freely as soon as I cleaned out the holder. There may be a tolerance problem and the brushes are sometimes too lose and let cutting dust get into the holder. I was able to add some 0.004″ thick copper tape to one side of each holder and the brushes were still free to slide. I soldered the copper tape to the brass brush spring contacts. I think the tape will close up the space to keep out dust and also reduce the brush temperature. I’ll have to do a few projects to see if the stuck brush comes back. The replacement 4200 appears to have a different material for the brush holder. The original was black and the replacement is white. Very true. It is really important to have an enclosed latch or something in the tool if there is any chance that the dust would accumulate after a while and hinder the motion of the brush. I bought one of these years ago, and they really do work very well! I like the 4200 and the quick change bit is a nice feature. When the bits slip out they can be put back in quickly without tools. My only problem is a new 9903 tungsten carbide cutter bit broke right in half in less than ten seconds of use. The top half is laying on my shop floor and the bottom half is trapped inside the convenient quick change head. Where to I send the ransom to free the trapped half of my disappointing cutting experience? I would focus on getting the collet out and the broken shaft should either come out with it, or more likely,slip out of the collet as its being pulled free leaving it loose and you should be able to tip the drenel down so gravity does its thing. The collet needs to be gently shifted so they can be eased out. I would get a new collet in case it has put up a fight and came out the sore loser. Hope that helps if you haven’t solved problem yet.